You may recall photographer Elliott Landy and the iconic colour infrared photograph of his, showing Bob Dylan, that was included in the Infrared 100 exhibition. Elliott has a distinguished portfolio of music-related material and has recently decided to pull together the best shots he took of The Band to produce a fine art photo book that he is funding via KickStarter. Actually I should say 'has funded' as he finally raised $193,626. I was a much younger person when I shelled out pocket money for a copy of Rag Mama Rag by the Band. They were Canadians who famously accompanied Dylan on the Basement Tapes and then became a key recording act in their own right. Their roots approach to music was matched by their image, and this was captured by Landy on over eight thousand frames of film. Only about 30 ever got widely published, some as album covers and posters, and he considers this his best body of work. His relationship with the band is rare for a photographer. The only other notable long-term collaboration I can recall is U2 and Anton Corbijn. The music occupied a hinterland between rock, country and folk; bringing an acoustic sound that became synonymous with Woodstock in up-state New York. For such a small place it has managed to carve a deep furrow in American musical history, and Vanity Fair calls Landy "the ultimate keeper of the Woodstock flame". 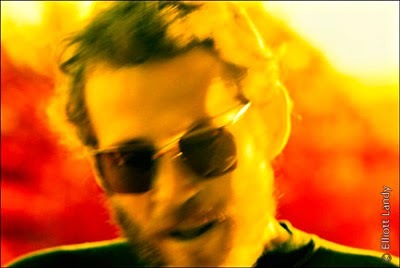 This photo of Levon Helm is one of the infrared shots (Kodak E4 stock in this case) which are included in the set. As with the Dylan shot, Landy didn't use infrared to exploit its characteristics (something I'm often guilty of) but more for what it could bring to the image. This is the KickStarter page ... now reached its target ... and this is Elliott Landy's own web site, which you can explore for more of his images. 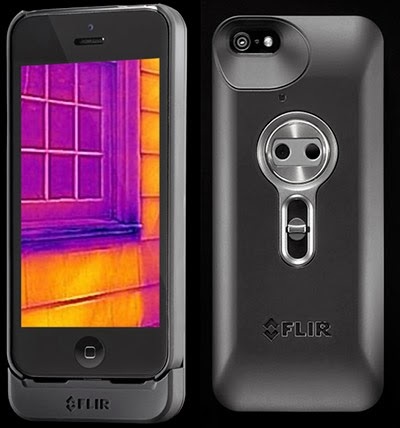 The leading manufacturer of thermal images, FLIR, have launched a prosumer thermal imager at CES. I mentioned the $200 IR-Blue in an earlier post but this new device appears to be much more like the existing thermal images we've seen from FLIR and others while having a retail price point of only $350. This is an amazing price point and opens up a whole raft of new applications in a whole new market. The unit fits onto an iPhone 5 (and 5s) and uses an iPhone app for control, display and recording - including movies - linking via USB. I couldn't find any information on spatial resolution but my guess is that the display is something like 320 pixels across. This is augmented by the ability to blend in a visual image to provide some detail to help identify features. The thermal core is FLIR's Lepton, which is a tiny microbolometer-based unit designed for consumer manufacturing scale. The thermal range for the scene is zero to 100 Celsius with a resolution of a tenth of a degree, which should suffice for most consumer uses and will certainly pick out a person in the dark. You can find out more either by visiting the FLIR ONE web site or on the CES video that the BBC shot. What is telling is that much of the FLIR promotional material is aimed at people who don't even really know what thermal imaging is or what it can do. A thermal image is (IIRC) regarded as a search in the US so there may be privacy concerns but a thermal image of a person does not show any significant detail. (That judgement was based partly on thermal imaging devices not being generally available to the public.) Hopefully we won't see any of the hysteria that greeted near-infrared photography and its so-called (and insignificant) X-Ray capability! Oh, and to save you asking, it's the area between the eyes and the bridge of the nose that best shows the body temperature, not the forehead. I see this as a really significant piece of kit and welcome FLIR's initiative. Worldwide launch is Spring 2014 'at popular retail outlets'.